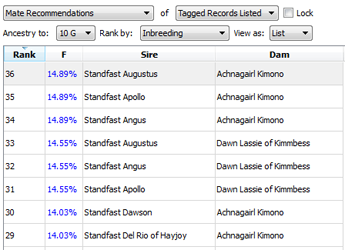 PedScope is software for advanced pedigree analysis, gene diversity measurement, inbreeding calculation and making recommendations for prospective matings. It has applications in captive breeding programmes e.g. for endangered species conservation or safe breeding practices within closed or small populations such as pedigreed livestock, cats, dogs, etc. It is available for both Windows and Mac computers. 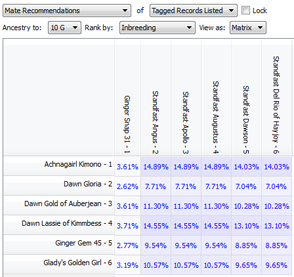 Computes various pedigree metrics including: Wright's coefficient of inbreeding; ancestral inbreeding coefficients; generation numbers; ancestry metrics including #generations seen, #generations full, #unique ancestors, etc. ; relation counts such as #offspring, #sibs, etc. ; age-related metrics including generational age, age at death, age at first child, etc. See Pedigree Metrics. Calculates various measures of genetic diversity including: the number of founder equivalents, the number of founder genome equivalents, and the effective number of ancestors, for any user-selected group of individuals that comprise a 'current population'. 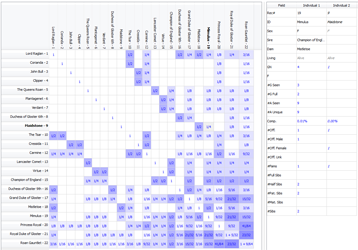 It can also perform detailed founder analyses for a group and report various details such as the proportion of genes present due to each founder, the genome uniqueness of each founder, and the percentage of each founders genes still present in the current population. It can also compute the mean kinship and kinship value for each individual within the group; metrics useful when making breeding recommendations aimed at retaining long term gene diversity within a population. 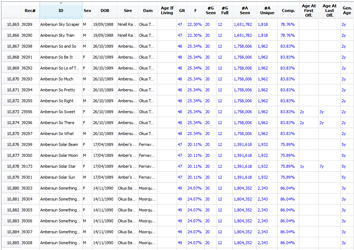 See Founder Analysis. Makes breeding recommendations (i.e. mating selection recommendations) within a user-selected group of individuals. This is intended to let you compute the best matings in order to meet chosen breeding criteria, and is aimed primarily at those wanting to select matings to maximize future genetic diversity within the ongoing population. Criteria that can be used include: the inbreeding coefficient of the prospective offspring, the change in overall gene diversity ('GD delta') that would result from the mating, the change in overall gene value ('GV delta') that would result from the mating, parental mean kinships, parental kinship values, parental genome uniqueness, and any custom weighted combination of these. See Mate Selection. Reports statistics for groups of individuals, e.g. average inbreeding, or the maximum number of offspring, or the median longevity. These can be produced for any user selected group of individuals. 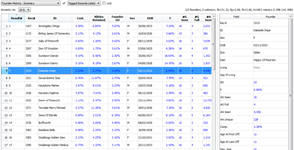 If the source data includes dates/years of birth then stats can be automatically computed for each date period. See Statistics. Creates graphs and charts to visualize date-based statistics including line graphs (e.g. average inbreeding coefficient per year), frequency bar charts (e.g. to see the distribution of inbreeding coefficients for all individuals born within a given date period), and correlation scattergram plots (e.g. to see the relationship between two metrics e.g. to plot inbreeding coefficient against longevity). Frequency and correlation plots are also available for group-based statistics (e.g., a scattergram to visualize the correlation between any two metrics for all individuals in a user-selected group). Correlation charts also display the Product Moment Correlation Coefficient (r) and Spearman Rank Correlation Coefficient (rs). See Graphs & Charts. Calculates and displays relationship matrices either for a single individual and a given depth of its ancestry and/or descendants, or for a group of individuals and their ancestors/descendants. See Relationship Matrices. 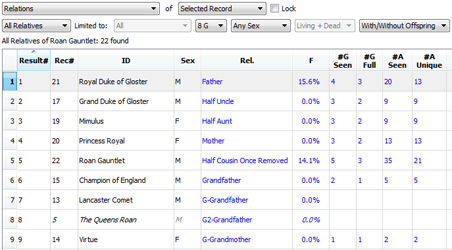 Generates detailed relations reports, such as ancestors and descendants, either for a single individual, or covering a group of individuals. 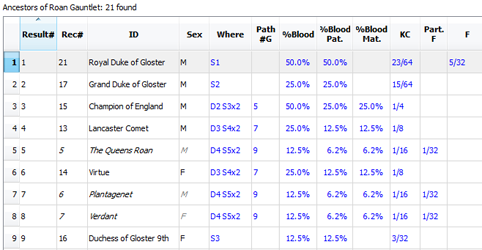 Ancestor reports can include #occurrences, min/max generation seen, %blood, path length to common ancestors, kinship coefficients to each ancestor, names of founder ancestors, and partial inbreeding coefficients for founder ancestors. See Relations Reports. PedScope has comprehensive export and printing facilities. You can print most of the charts, graphs and tables created by the program. You can export any data table or matrix as PDF, text/CSV, XML (for direct import into spreadsheets such as Excel), HTML and Open Document Format (.odt). You can save any graph, chart or pedigree as PDF, JPEG, PNG, Scaled Vector Graphics (.svg, for websites), and other bitmap image formats. 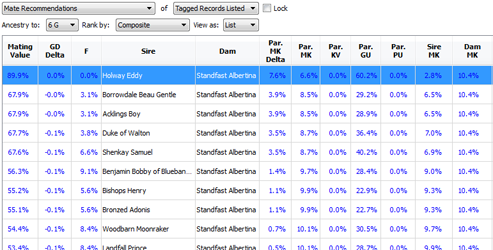 PedScope works with data stored externally in text files (e.g. tab separated, or comma separated (CSV) files). See Source Data. User Guide: A comprehensive User Guide is included (use the Help menu within PedScope). Alternatively view the PedScope User Guide online or download a PDF version here.